Though post-credits scenes are increasingly associated with the Marvel Cinematic Universe, they’ve always been fair game for any genre. Matthew Broderick shooed away lingering audiences after the credits wrapped on Ferris Bueller’s Day Off, while The Grey ended with round two of that “Liam Neeson versus a wolf” fight. There are obviously a lot more, but a new book reveals an artistic little stinger was originally planned for Joel Schumacher’s horror-comedy The Lost Boys. 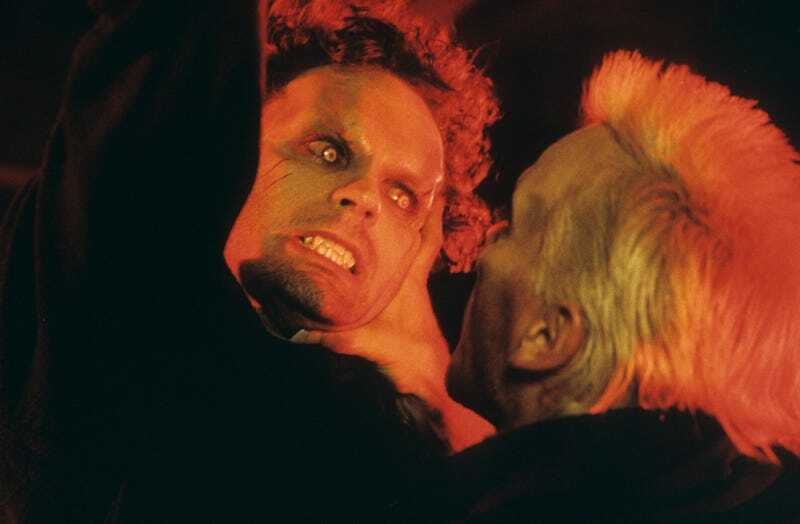 The folks at io9 got their hands on Paul Davis’ book, Lost In The Shadows: The Story Of The Lost Boys, which includes a look at the original script from Jan Fischer, Jeffrey Boam, and James Jeremias. And apparently, after the head vampire Max (played by the late Edward Herrmann) met his end at the hands and car of Grandpa, the camera was supposed to fly out over the boardwalk, where it would settle on a mural from the early 1900s. Among the painted images was a man in a straw hat and a broad smile, assumed to be Max, chatting up some teen boys. Lost In The Shadows even has an illustration from Gary Davis on this talk between Max and his new recruits. As for why the post-credits scene was never shot, production designer Bo Welch said the decision was only partially financial. On the one hand, the budget had been cut by 35 percent prior to filming, which meant they needed to be a tad selective about what to shoot; on the other, Grandpa’s “damn vampires” closer already offered a solid ending, so the point was rendered moot.